Maintaing composure is critical to playing your best. The emotional and mental aspects of golf cannot be overstated, especially if you are a beginning player and find yourself in one frustrating spot after another out on the course. But by learning how to harness your emotions during a round, you will be able to both score better during play and enjoy the sport much more. Have a short memory. 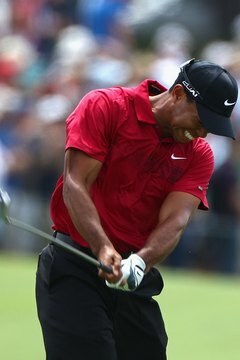 Whether you hit a great shot or a terrible one, it is OK to feel emotion. However, you must quickly forget what you just did and refocus on the shot coming up. This requires mental discipline, which can be developed over time by staying in the same routine before each shot. Accept the consequences of a bad shot, and then try to minimize the damage to your round. Do not compound your problems by attempting to pull off a miracle shot to make up for a poor one. By keeping your emotions in check and allowing yourself to simply hit the ball back into the fairway, you might keep a bogey from becoming an unmitigated disaster. Realize that you have limitations off the tee and avoid over-swinging to try to add distance. Swinging harder will only throw off the mechanics that you have developed, and the possible reward is not worth the risk of balls slicing and hooking out of bounds or into trouble. Stay out of driving contests with your playing partners and remember, the goal of the game is to score, not to see who can hit the ball the farthest. Allow yourself to have fun. Remember that you will not be anywhere close to perfect during a round. By emphasizing the positives, even when things are going badly, you can avoid making mistake after mistake that can ruin a round. Focus on what you are doing right, the fun you are having, the exercise and scenery that you are enjoying. Know when your ego is trying to take control of your golf game. When you are considering trying to drive over a dogleg to cut a stroke off a hole or trying to drive an approach shot over water rather than laying up, you are letting your ego take over. Have a plan for each hole and stick to it. Trying to make up ground on certain holes often leads to an even more inflated score.